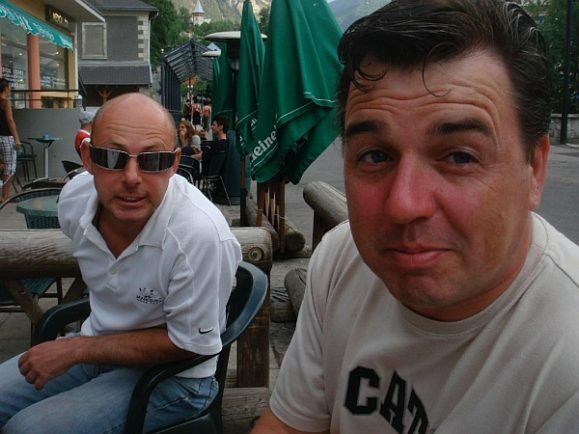 Suffering the effects of sleep deprivation compounded by too much wine Gaz, Taj and Pete decided not to ride today. 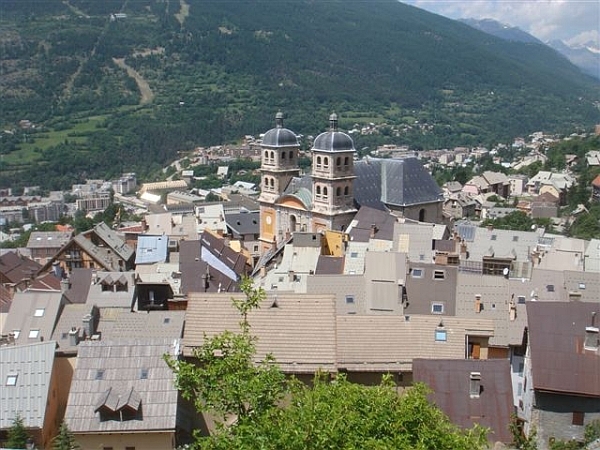 Instead they spent their day exploring Briancon’s rich history – that’s what they told the rest of us anyway. On 8th July 2008 – next week – several buildings including the city walls, Redoute des Salettes, Fort des Trois-Tetes, Fort du Randouillet and the Asfeld Bridge are due to be classified as UNESCO World Heritage sites. 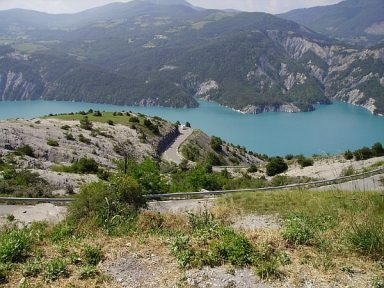 For the rest of us – who aren’t adverse to a bit of culture but had different priorities – the plan had always been to ride south to Lac de Serre-Poncon and cut across to Barcelonnette to ride a 75 mile loop over 3 passes. 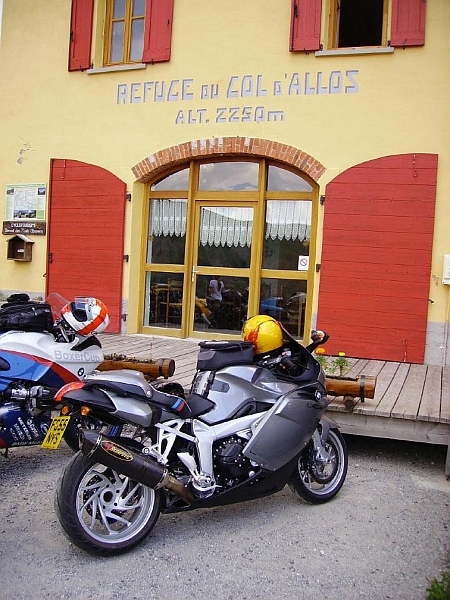 Our ride home would depend entirely upon how we felt when we arrived back at Barcelonnette. We could either retrace our steps and return via the lake or head back over another pass and return via Guillestre. 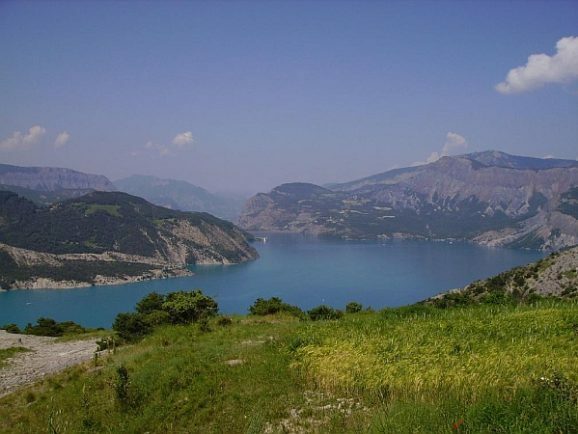 Leaving Briancon we immediately picked up the N94 and headed south towards Lac de Serre-Poncon. This was a really enjoyable 35 mile run that took us past Embrun. It was here that a desperate search for fuel by Cat and Kyle ensued leaving Phil and Chris waiting patiently on the side of the road in the shade – those damn V-twins with their tiny fuel tanks and short ranges. At Savines-le-Lac we turned left onto the D954 which ran around the edge of the lake and this flowing stretch of road was superb. Whether you’re on a bike or in a car the views are absolutely stunning. 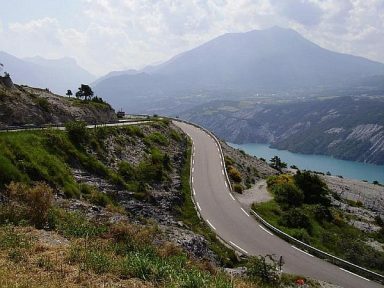 In fact our ride around the lake rates as one of the rides of this tour with a mix of sweepers, twisties and hairpins that provided plenty of opportunities to get your knee down. It’s obviously a bit of a favourite with the locals too as there were some seriously quick bikes out there. Chris particularly liked the Italian he saw coming round a tight left-hander, Ducati cranked right over, knee to the ground with a grin that stretched from ear to ear. 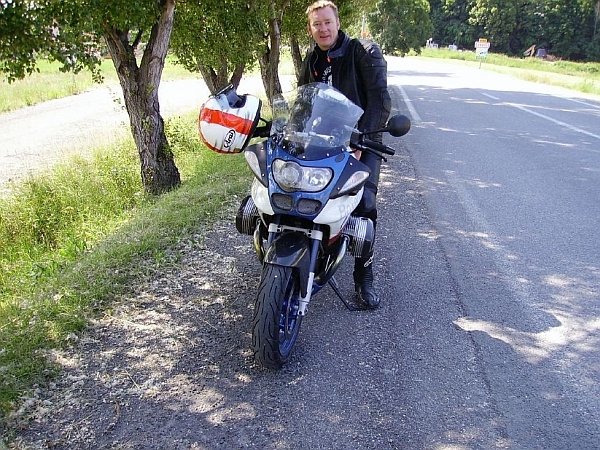 His left-handed thumbs-up made riding on the wrong – take that as right – side of the road look very cool. At the end of the lake we picked up the D900 which took us into Barcelonnette where our 75 mile loop started and would ultimately finish. Turning right we briefly picked up the D902 until turning right again to pick up the D908 where the loop effectively began. 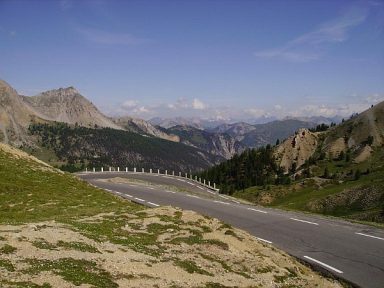 Our first pass today was the Col d’Allos and our run up on this side was very pretty with some stunning views. The road is very narrow though and in some places our overtakes needed to be planned. Having said that, the few cars that we did encounter were easily passed. 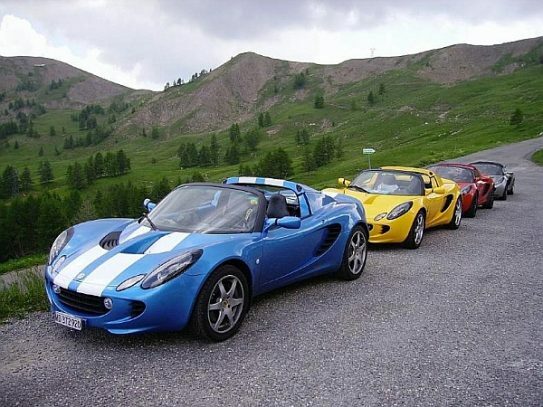 Stopping at the refuge at the top of the pass we couldn’t help noticing that we weren’t the only petrol heads in the area today when we spotted 4 Lotus Elise’s parked up on the side of the road. At this point it was lunchtime and seeming like as good a place as any, we pulled over and stopped for something to eat. After lunch we dropped down the other side of the Allos and while nice enough it didn’t quite offer the same stunning views that we’d experienced on our ride up. Near the top there was a series of tight switchbacks and once negotiated we rolled down through a number of dreary looking ski resorts until we reached Colmars. At Colmars there was a sign pointing left for the Col des Champs, towards Saint-Martin-d’Entraunes, and to be honest this road was pretty dreadful. Actually it was worse than that, after more than 3 hours in the saddle it was downright uncomfortable. 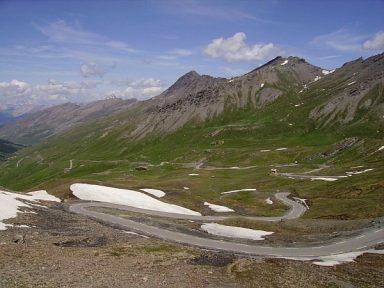 However, once we reached the top the road down the other side was very nice – ideally this pass would have been better ridden in reverse. 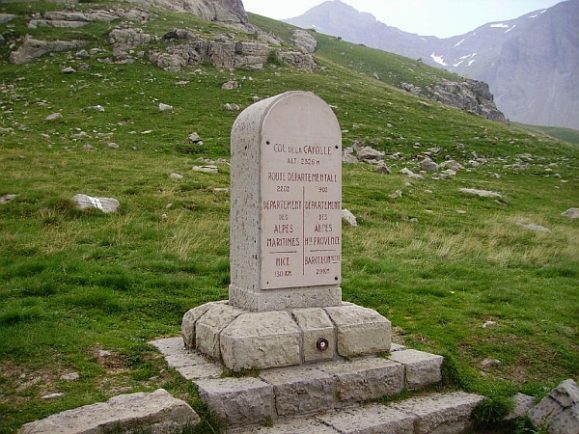 At St. Martin we turned north onto the D2202 and began making our way back to Barcelonnette. 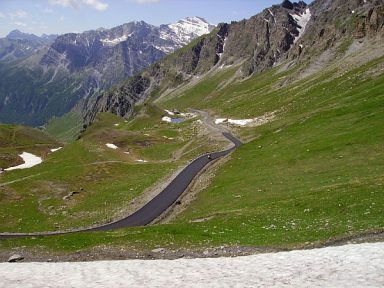 This road took us over the Col de la Cayolle and this was great to ride on both sides. It was possibly a pass too far though because at this point we were all beginning to tire a little. Arriving in Barcelonnette we had a decision to make. 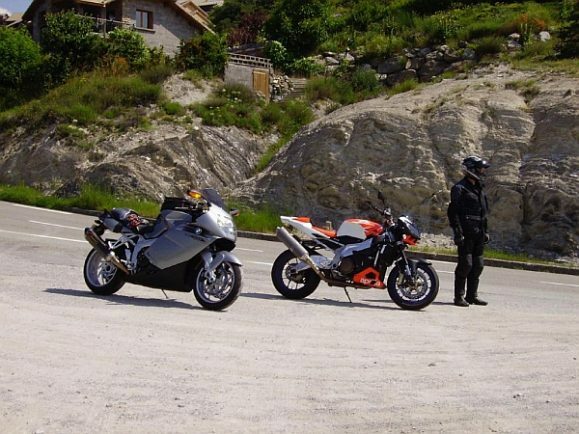 We could either retrace our steps and ride back to Lac de Serre-Poncon picking up the N94 to Embrun and Briancon. 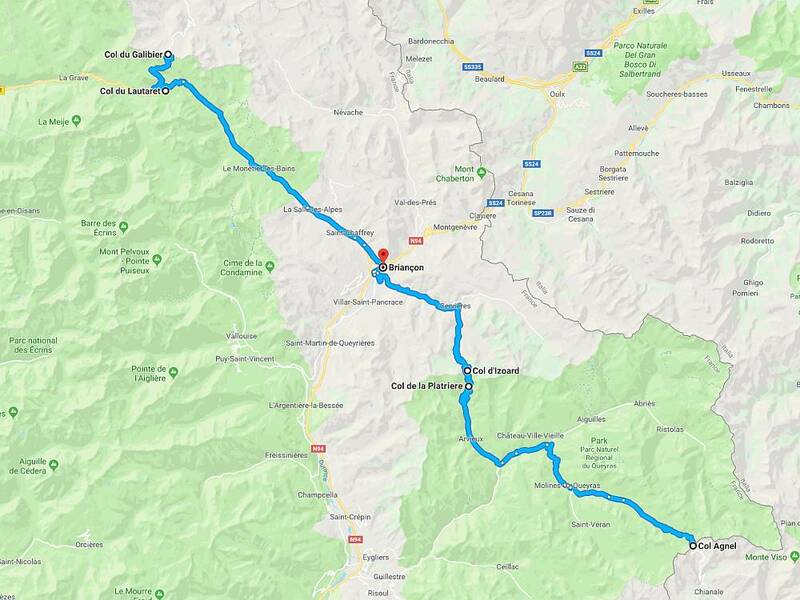 Or we could turn right towards Jausiers and make our way over the Col de Vars – as we’d done yesterday on our way in from the Bonette – to Guillestre and from there pick up the N94 to Briancon. In terms of time and distance there isn’t much in either of these routes. They both take around 1h 45mins to ride and via the lake it’s 60 miles while via the Vars it’s 50 miles – we opted for the shorter route. 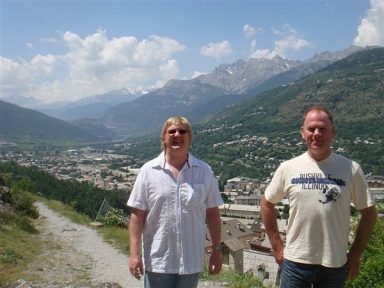 We arrived back in Briancon at 5pm to find that Gaz, Taj and Pete had decamped to the bar that we’d been to last night. And it was significantly busier today than it had been yesterday. The majority of us aren’t great fans of football so it came as a surprise to find out that tonight was the Euro 2008 Final between Germany and Spain. 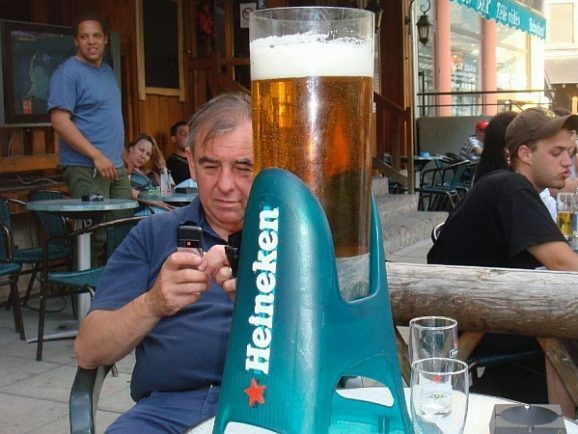 We had a cunning plan though that would cut down the queuing time at the bar. Despite our heavy night spent in the bar celebrating Spain’s win over Germany there was a full complement of us today and we had big plans to ride some seriously big mountains. 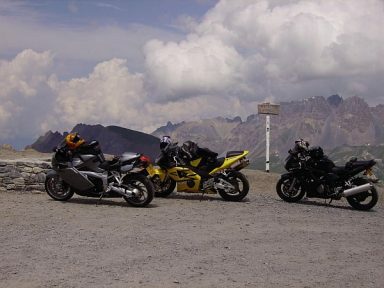 These included a 2,744m monster that would take us out of France and into Italy. 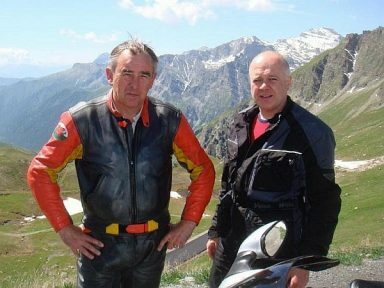 Once in Italy we would ride towards Cuneo and find somewhere to stop for lunch before returning to Briancon by way of the Maddalena Pass and yet another trip over the Col de Vars. In all a 7 hour and 180 mile day out. But as the saying goes, the best laid plans of mice and men and all that. 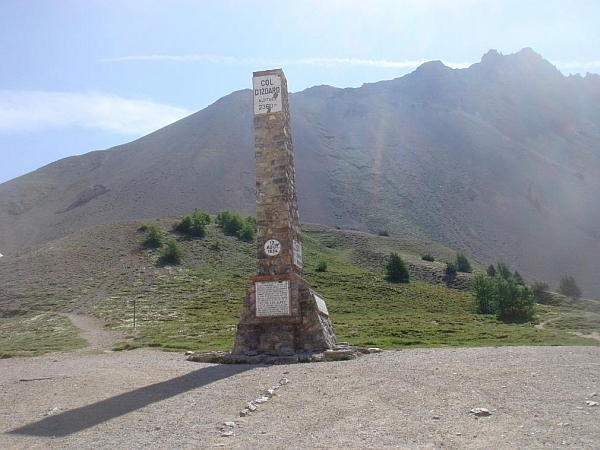 We left Briancon and headed for our first port of call, the Col d’Izoard. The Izoard starts pretty much from the centre of Briancon and it really was superb. In general it was well surfaced with a really fast lower section followed by hairpin after hairpin after hairpin as we neared the top. We stopped at the monument that marks the top of the pass and on closer inspection we spotted a date on it, 12th August 1934. 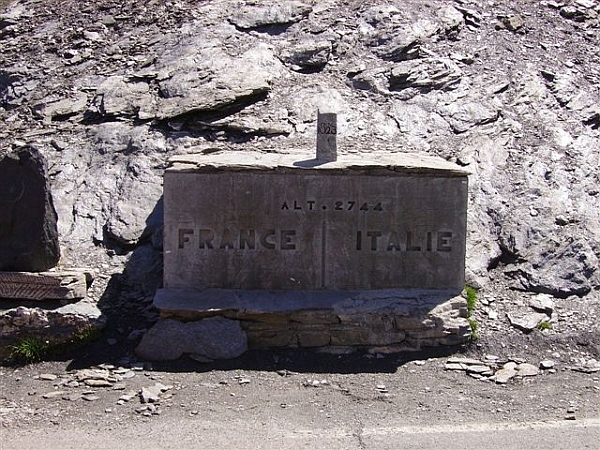 This is the date the road was completed by the French military and apparently many of the Alpine roads we’ve been riding were built by the French military in the 30s in an effort to guard against an invasion by the Italians. A couple of miles down the other side of the Izoard we rode past the barely noticeable Col de la Platriere and followed the road all the way down to the bottom of the pass. At the D947 junction we turned left towards Chateau-Ville-Vieille and then right onto the D5 towards Molines-en-Queyras. 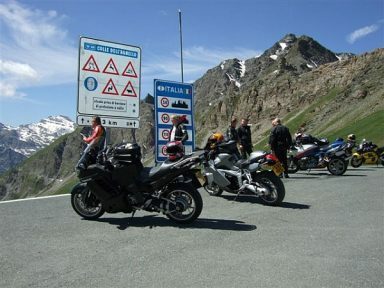 At Molines the D5 effectively ends and from here becomes the D2205 to the Col Agnel – the 2,744m monster that was to be the highlight of our day. As we approached the bottom of the pass however there was a sign that said “ouvert” on the French side but “ferme” on the Italian side. 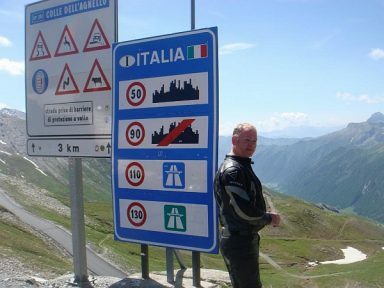 We paid no attention to this though because as John Hermann’s book, Motorcycle Journeys Through the Alps and Beyond, had told us, this was frequently the case and to just ignore it. The ride up the valley was sensational, very highly recommended, and while there were a few roadworks early on this didn’t dampen our enthusiasm for this pass. 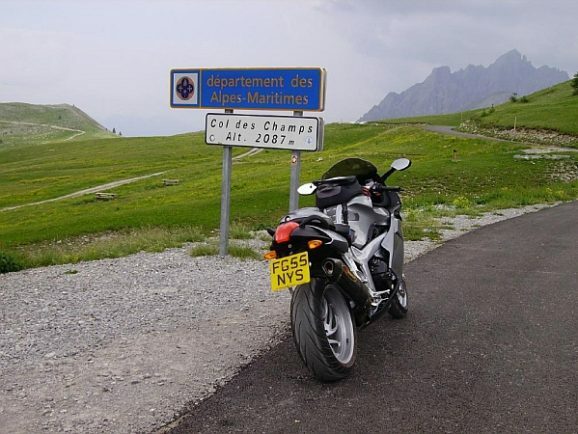 The road surface was brand new and it was another wonderful mix of sweepers, twisties and finally knee down hairpins all the way up to the French-Italian border at the top. 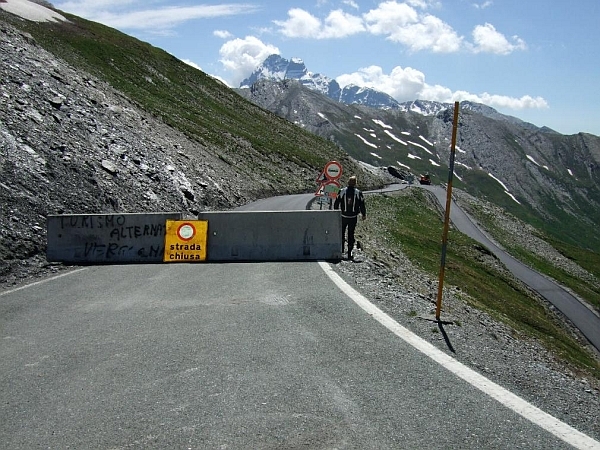 Unfortunately this is where our ride over the Agnel ended because the road was indeed closed. Looking south into Italy though the road looked fine so Gaz volunteered to squeeze his Blackbird past the concrete barrier and ride down the other side to see if the road really was closed. 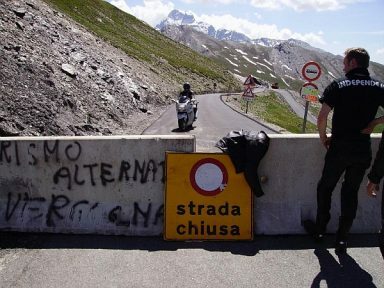 Our intrepid volunteer headed off down the valley managing to get about 5 miles into Italy before he encountered an excitable group of Italian road workers. They seemed to be quite agitated waving their arms about and gesturing a lot. Not speaking a word of Italian Gaz decided discretion was the better part of valour and made a retreat back to France. 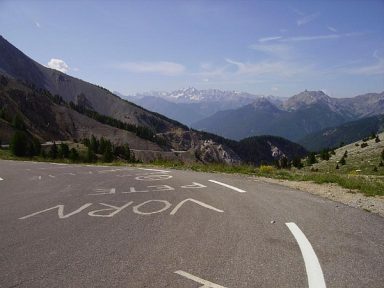 It later transpired that the road was closed for resurfacing work because on 20th July stage 15 of this year’s edition of the Tour de France would be coming up and over the Agnel for the first time in the history of the race. With no other option the only thing to do was head back down the valley the way we’d just come and make a new plan. 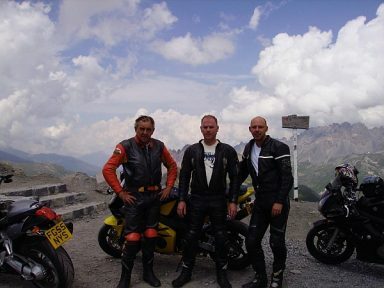 The new plan we hatched involved us riding back into Briancon and out the other side along the D1091 up to the Col du Lautaret. 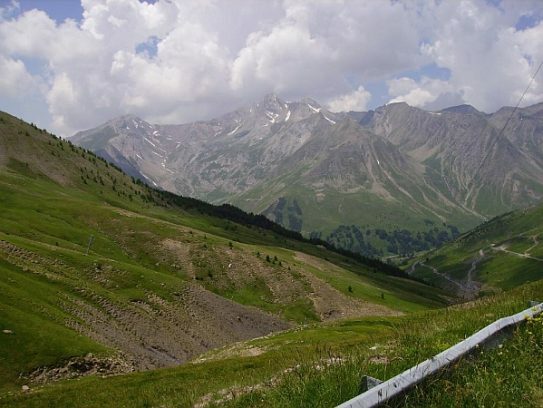 From here we would have access to another monster mountain – the Col du Galibier. By now it was lunchtime so on our way to the Galibier we stopped off for a bite to eat in Le Monetier-les-Bains where we found a very nice cafe run by a pleasant British couple. During lunch there was a bit of chatter between Chris and Pete and they decided it was too hot to ride any further today. 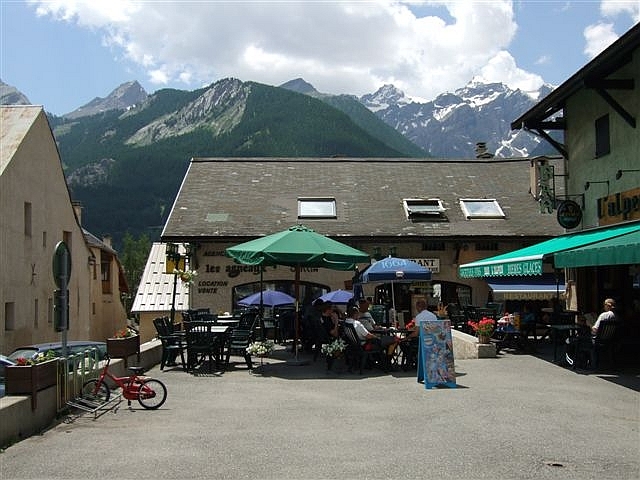 They were going to head back to Briancon and on the way find somewhere to stop off for a swim to cool down. 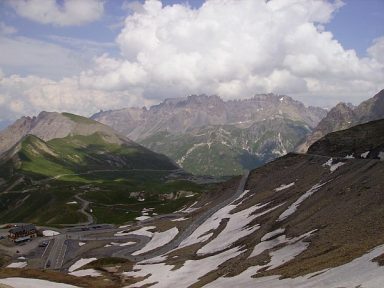 Meanwhile the rest of us set off in the opposite direction with the thought, at a lofty 2,645m, the top of Galibier might be an equally good place to cool off. 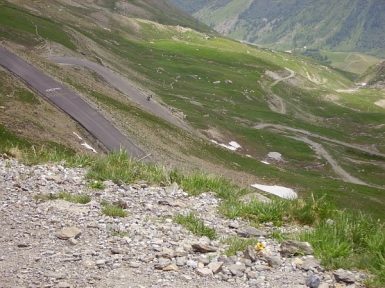 The road up the Lauteret was wide and fast although it was barely noticeable as being a col. At the top we turned right onto the D902 and were immediately on the Galibier. The road up was good but many of the bends on this side are blind where campervans seem oblivious to road markings. As a result we could almost guarantee they’d be on our side of the road when we entered or exited a corner. 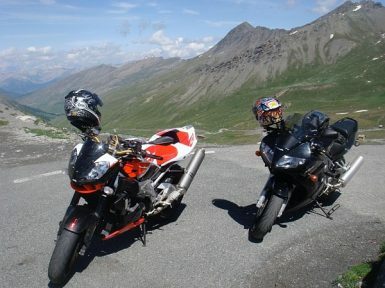 The views from the top of the Galibier were probably the best of the entire trip however not everyone made it up there. 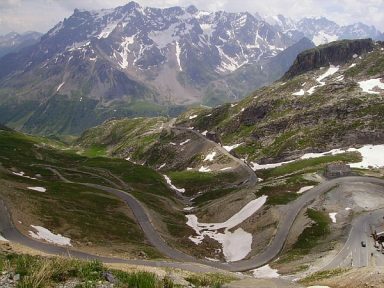 Gaz and Cat swapped bikes at the bottom of the Galibier and on their way up Cat’s Tuono had developed a death rattle – in all likelihood a broken cam chain tensioner. A mile or so below the summit Phil, Taj and Kyle passed them parked up on the side of the road, and thinking they were just swapping bikes back again, carried on with their run up to the top. After a good 15 minutes spent waiting at the top the penny finally dropped that there was bike trouble. And that pretty much brought an end to our day, and in all certainty the end of Cat’s tour. 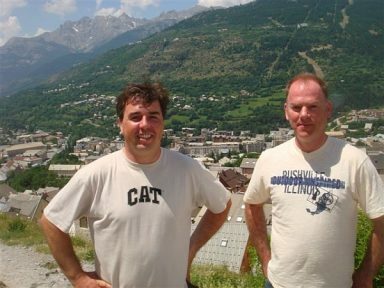 It wasn’t a total disaster though, he did manage to limp back to Briancon – rolling most of the 20 miles – but that was as far as Cat’s Tuono would make it on this tour.